Body Pillows are a great addition to any bed because they can be both decorative and functional. These pillows can be laid across the headboard during the day and hugged at night to sleep. 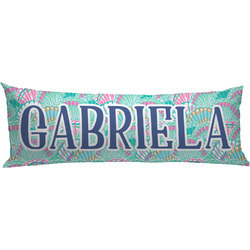 Our body pillow cases are customized with your design and personalization. We offer many different prints and patterns, and many of our patterns are available in many different colors - so you should be able to find something you like. Our customization interface makes it really easy for you to see what it will look like before you purchase. 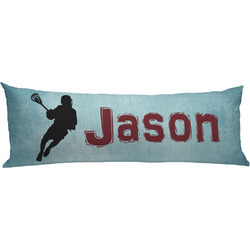 So start customizing on our website and see what your very own pillow look like. 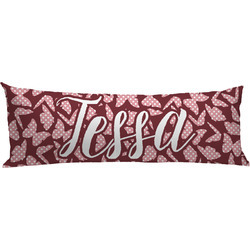 Your custom design will appear on the topside, which is made from a soft micro fleece and the back of the pillow has a matching soft polar fleece in white. The body pillow cover has an opening for inserting the pillow, which is NOT included. I bought this pillow cover for myself. It is so prettt and so soft! I ended up ordering two more for my daughter in laws! Came out exactly how shown when purchasing. Perfect fit on an UGG body pillow. Very happy with the quality. Arrived ahead of schedule. Wife loves it. I love the design and colors. Very neat to be able to personalize it. Shipping was fast. The material is different than I thought it would be and seems like it may bead up. Time will tell. I only gave 3 stars because the cost is outrageous for a pillow case and that is only printed on 1 side. I actually was tempted to cancel my order when I thought about the price later but due to the fact that it was personalized, I wasn't sure I could. I would think long and hard about purchasing something this overpriced again.